All transactions are safe and secure with a reliable history in online purchasing behind each of our associates. 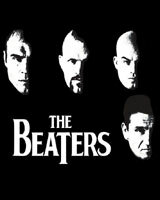 Buy The Beaters MMA t-shirt to own UFC clothing and merchandise. This attractive UFC apparel item celebrates four legendary fighters, including full time MMA fighter Chuck Liddell, a former Ultimate Fighting Championship (UFC) light heavyweight champion. Before becoming a mixed martial arts fighter, Chuck Liddell was a collegiate wrestler and a professional kickboxer. He is an unorthodox striker. Chuck Liddell is joined by MMA legends Randy Couture, Tito Ortiz and Ken Shamrock. This unique design labels them "The Beaters". In addition to The Beaters MMA tee above, browse the UFC Clothing Gallery for more apparel like men's and women's clothes, kids shirts or hoodies.